Africa, The US and Iran: Could a US Strike provoke a War? We all have heard the reports indicating that the United States will strike Iran if it doesn't End its Nuclear Program. Speaking in Tunisia the Iranian Commerce Minister stated that one of the Goals of President Ahmadinejad is to have closer Relations with Africa. Before the Ethiopian Army decided to intervene in neighboring Somalia and restore the Transitional National Government, The US State Department released a report on a worse-case scenario of how the Fighting Could Escalate. The report feared that both the US and Iran could get involved in the conflict either directly or by proxy. Since there was no Direct conflict between the former allies we can assume that a proxy war is still possible and could involve Eritrea. The second potential sight of a proxy war is in Zimbabwe. President Robert Mugabe clings to power despite rampant Inflation,High Unemployment, A shrinking Life Expectancy and an increasing Political Opposition. In the Past Zimbabwe and Iran have signed deals that would provide much needed Petroleum to shorten the lines. In return Zimbabwe has been steadfast in its support for Iran as it deals with the Western Allies in the Nuclear Crisis. the Political Opposition has received tacit support from Western Powers. In fact the Former US Ambassador to Zimbabwe was in attendance more than once at High Profile Trials involving the Political Opposition. So like in Somalia we should stay tuned for further developments. 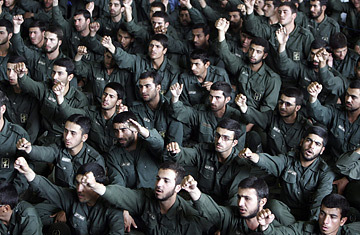 Here are some members of the Iranian Revolutionary Guard. Could the US Marines or Special Forces be tangling with them in Africa sooner than later? Now lets go to a region where strife has been rampant for the last decade. West Africa. And to one Nation in Particular the Gambia!! President Jammeh has made it known that not only does he support Iran but he also has close ties with El Presidente Chavez of Venezuela. Recent events in the Gambia could lead to tensions between Washington and Teheran for one crucial reason. The Relationship between the US and Senegal is crucial. Internally the Gambia is in Crisis. Independent Media Outlets are cracked down upon. Recently 2 Investigators for Amnesty International were detained after being trailed by members of the Internal Security Forces. Torture is widespread in the country as well. And with Guniea-Bissau on the verge of becoming a Narco-State that means the US will be placing the region under closer scrutiny. Another potential flashpoint is Darfur but there is enough information regarding that crisis in print already. The view of the Eagle is that these MAY Happen. It is not a sure bet that they won't happen either.